Ok. As you may recall, on Tuesday night of this week I wrote a blog about how I had messed up with this guy whom I admire and believe is an awesome Internet marketer. That post was written almost immediately after the incident. One of the steps (secrets) to Letting Go of Stuff is to do everything you can to influence a situation before you choose to – let it go. Wanna’ know the outcome of that situation from Tuesday? I contacted the guy, apologized, and let him know how important it was to me, to develop a professional relationship with him. Now, we are back on track and communicating via email. He has provided challenging and valuable feedback about the most recent website for my home study course. I believe that the result will be, in the long run, better for my professional growth as an Internet marketer. The moral of the story: one is never too experienced to learn a lesson in humility. As soon as you believe you can’t learn anything new, that is when you become the most ignorant. I am a full time, life long, soak it up, student of and for life. If you are not, then you should be too. 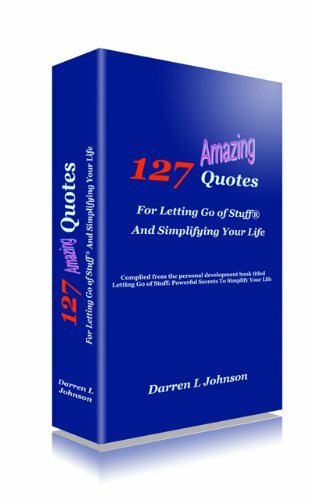 This entry was posted in Biz and tagged darren l johnson, fear, letting go of stuff, stress. Bookmark the permalink.